Eric Avery began this book in November 1999 in collaboration with students and faculty at the UTK Print Workshop, Department of Art, University of Tennessee, Knoxville. Pictures That Give Hope was printed during the Southern Graphics Council Conference at the Department of Art, The University of Texas at Austin, March 2001. David Paar, M.D. helped with the text. M.D. 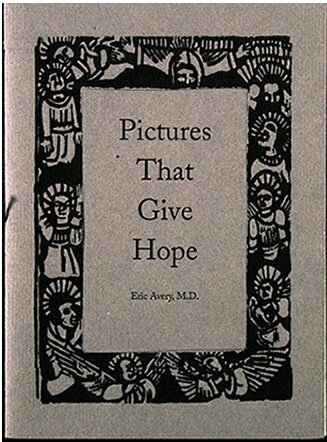 Williams helped with the digital layout of the book and printed Dr. Avery's reduced relief engraving of The Life Cycle of HIV Showing Sites of Action of Medications attached to the back cover. It is printed on Japanese Chiri handmade paper. The book was set in Adobe Caslon and printed by Bradley Hutchinson at Digital Letterpress in Austin, Texas, on Zerkall mouldmade paper contributed by Barry Moser. Eric Avery made the endsheet paper from abaca, cotton rags and used surgical towels. Britt Stadig coordinated the assembly and binding by volunteers.